Stephanie Phillips: I was obsessed with superheroes as a kid and was always drawn to the medium. I didn’t seriously start reading comics until I was in high school, and then didn’t take a stab at writing them until I was in my PhD program. After working as an academic and a writing teacher, I fell into comics because I really needed to allow my brain to do something creative. Switching the focus of my writing career to comics is one of the best decisions I have ever made, but I am also really glad that I have other careers behind me that have helped prepare me to work in comics. Where did Kicking Ice begin? 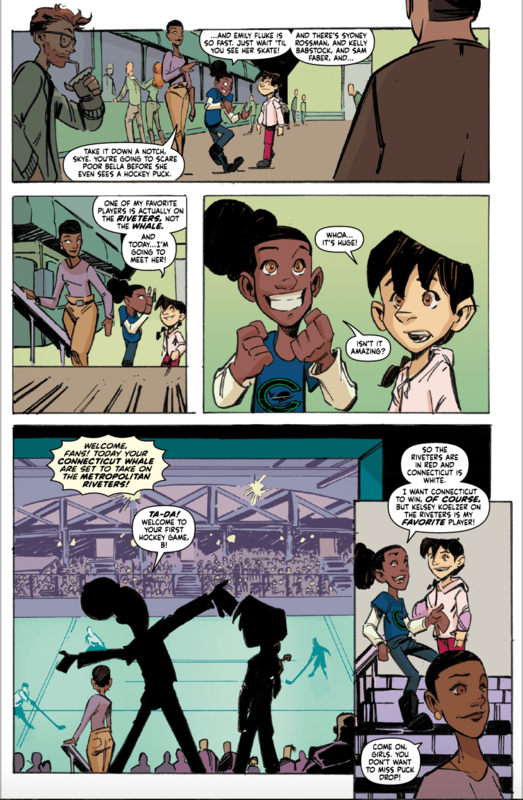 Phillips: My initial idea was to explore women in sports through a web comic. 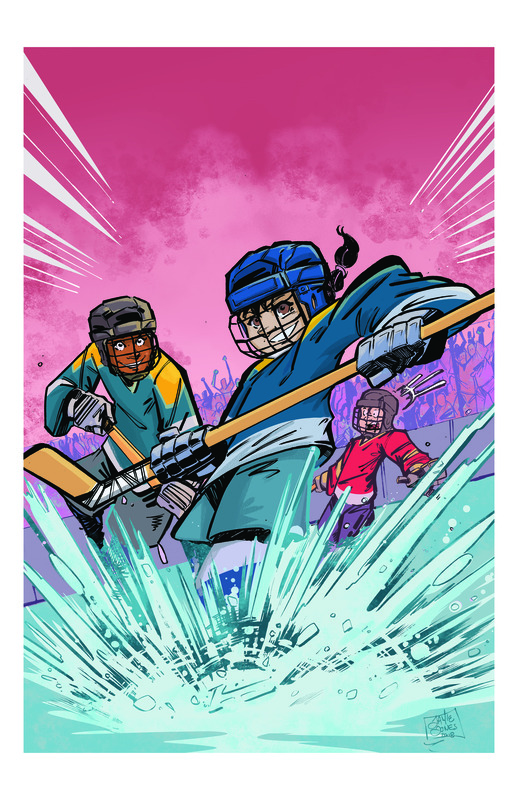 With the approach of the 2018 Olympics, and my personal investment in hockey as a former player, the idea started to evolve into a more developed graphic novel. With the infancy of the NWHL, it really seemed like a good time to discuss a partnership with them, and the story just kept developing as the NWHL and our publisher Ominous came on board. Now as a guy in Connecticut I have to ask, why did you set the book here? Phillips: We always planned on setting the story in one of the cities with an NWHL team. One thought process was, if we continue to make more Kicking Ice stories, we could have stories that are set in each city with an NWHL team. I also considered that if we continue to tell stories about Bella and Skye, we wanted them to have easy access to locations where their youth hockey teams might play. Placing them in Connecticut was partially random and partially about what else is around them geographically. So, yes, I suppose I’ve just spoiled a couple of our ideas moving into a possible Kicking Ice Vol. 2! You mentioned Bella and Skye. Who are they? Phillips: Bella and Skye are the main characters of the story. Bella has just moved to Connecticut from Boston, and Skye becomes her guide to all things hockey. Skye has been playing hockey for a few years, so she is already a skilled player and well acquainted with women’s hockey. Bella and Skye form a very close friendship around their love of hockey, and Bella learns to play in order to join Skye’s youth hockey team. When you first approached the NWHL, what were those initial conversations like? Did have the book plotted out and did they get the concept? Jamie at what stage did you come into the book and what interested you? Jones: I was brought in after the kickstarter was over. Some character sketches were done and the script was completely finished. I just had to get it there and draw a comic. The real selling point for me was working with Stephanie. That and I have a real love for all ages comics. It was an easy yes for me. As you were drawing the book, what was the biggest challenge for you? Jones: The biggest hurdle was the hockey gear. I wanted it to look right, but not only right it needed to fit the style of the book. I have pages and pages of helmets and padding and skates. This was all up front work though and once I got to drawing pages it wasn’t a issue. But, during the book I had to draw so many actual players. Likenesses are always tough and with the added stylized approach we took to the book cartooning the players from the NWHL became the hardest part. I would spend days just on those few pages making sure they felt and looked right. How did the book end up at Ominous Press? Phillips: I have worked with a few of the guys at Ominous in the past, and when they heard about this project I was developing, they were really interested in helping grow the idea. Thanks to Ominous, we are able to do so much more with this book than just online comics, which was the initial concept. The cover says “Volume One”. Do you have plans for more? You clearly had ideas and experiences you wanted in this first volume, what would you like to go into deeper and explore if you make more? Phillips: There has been talk of a second volume, though our main focus is on getting the first volume into everyone’s hands. I definitely think it’s worth exploring the relationships between Bella and Skye a lot more. While the first volume gives readers an overview of the NWHL and the sport of hockey, I think the benefit of a second volume is that we could really do a lot more with our two main characters after establishing them in the first volume. One thread that was interesting was Bella’s mom, who can skate, who’s played hockey, who teaches her daughter, but she never had the same opportunities to play. Phillips: It’s funny you mention Bella’s mom. Bella’s mom initially had her own “prologue” of sorts, where the reader actually got to see her trying to participate in a male-dominated sport as a kid before something like the NWHL ever existed. This was, in part, meant to highlight the amazing work that the NWHL does in giving girls role models to look up to. I would still love to include Mary’s backstory, perhaps as a bonus in the next volume. I know you’re both working on a few comics projects right now. What else do you have coming out soon? Phillips: I’m at that amazing and yet horrible point in creating where I am working on a few really big projects, but I’m not allowed to talk about them. I do have a horror series, Devil Within, coming out from Black Mask Studios on September 26, and I have been working with Top Cow/Image Comics on a short story after winning the 2018 Top Cow Talent Hunt. I definitely look forward to announcing some of my other projects soon. Jones: I have a few comics that I am going to be releasing under my own label. The Whisper, an anthology project that I run on my Patreon site and I am planning a Kickstarter for an all-ages pulp action adventure book, The Baboon. Which I hope to get running and up by the end of the year. What’s your elevator pitch for the book? Why should people – even those who don’t care about hockey – pick it up? Phillips: Kicking Ice is about the importance of equality and inclusiveness in sports. While Bella and Skye learn to overcome bullying in order to participate in a male dominated sport, the idea is that we continue to find ways to support and empower girls and women. 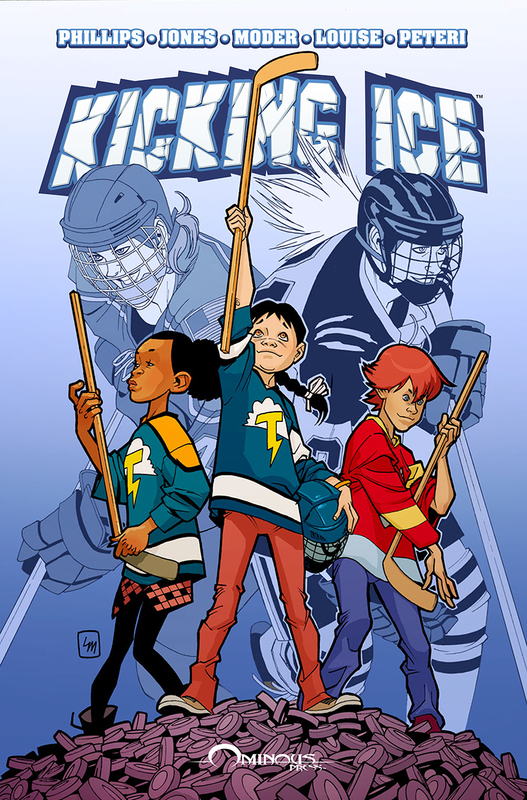 Jones: Kicking Ice is an all-ages, girl-power, feel-good comic that is more about the characters than it is about the sport. It fits nicely on the shelf with The Mighty Ducks and Little Giants.